We support the 2nd Amendment here at Castle Argghhh! This is our collection. 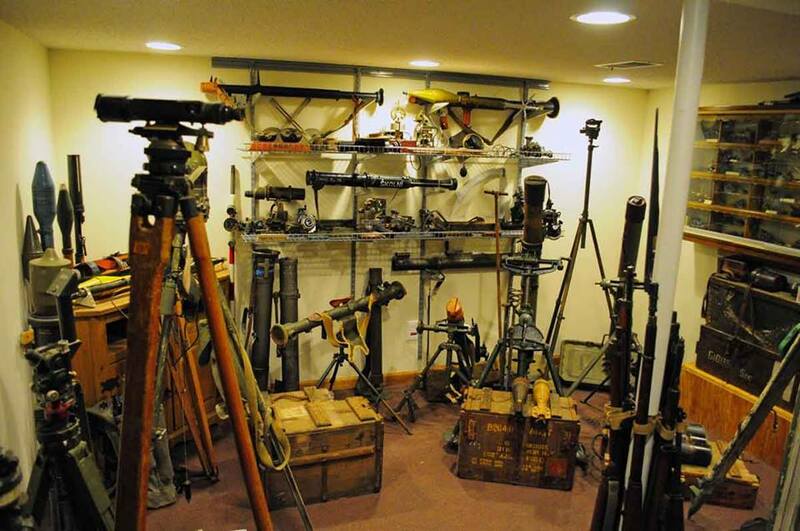 John has been collecting guns and militaria since he was a teenager. 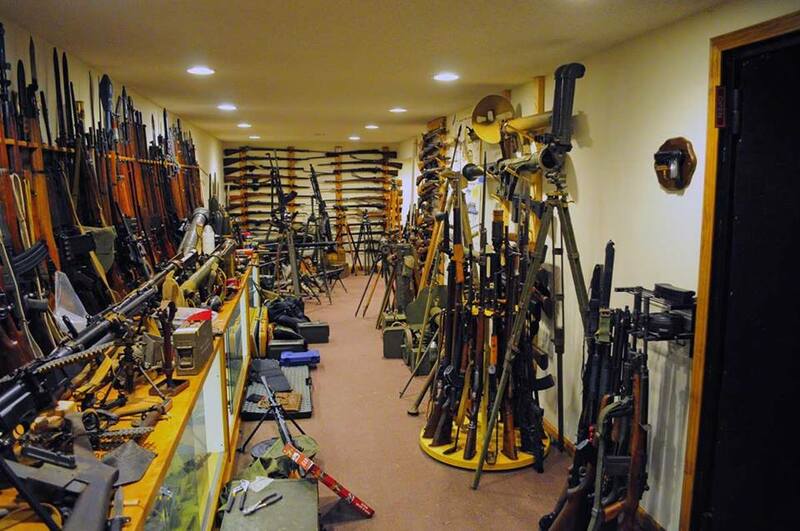 As you can see, our collection is more than just guns. We have sights, aiming circles, dummy shells, dummy grenades, demilitarized machine guns (because we could not afford to own working machine guns like the Vickers or Maxim), and all the accouterments. For example, we have two Vickers Machine guns – both are unworkable, but… John has collected all that went with them – from a parts box with all the parts to the water jackets and hose and water can. We even have a New Testament issued to Australian troops in WWI. You have to be a special kind of nutty to do this. John was a military historian for part of his career in the Army, and he can tell you a lot about everything we own. 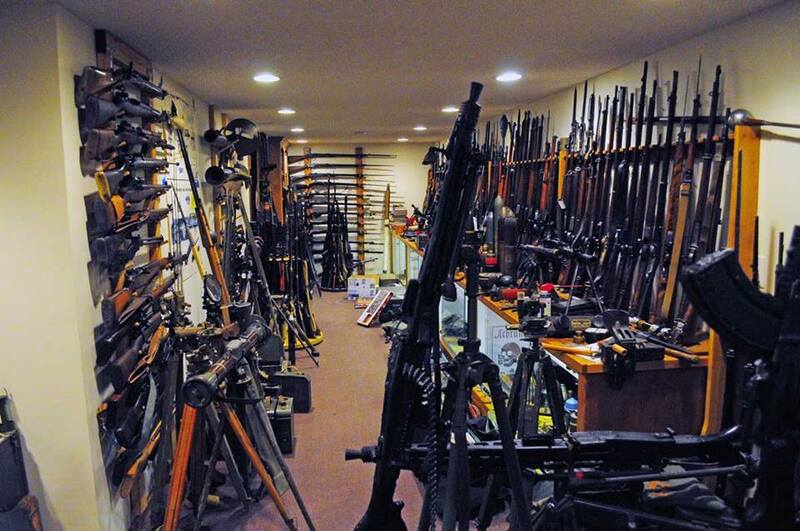 This entry was posted in Guns and tagged 2nd Amendment, collection, gun rights, guns, militaria, rights. Bookmark the permalink. 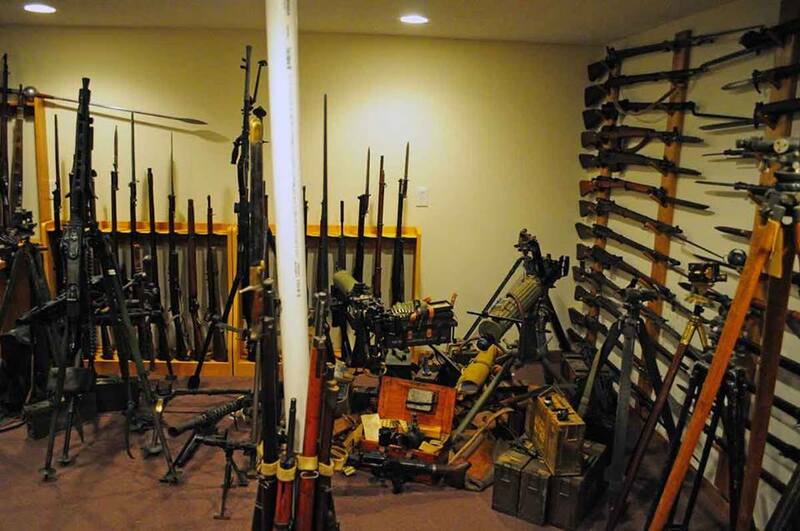 14 Responses to We support the 2nd Amendment here at Castle Argghhh! holi canoli. You need a bigger basement. I’ll pass it around. Watch what happens. When you get there, clamor for close-ups. John blogged for years and quit about a year ago. He got blogged out. His blog is still up – Argghhh!!! He was a gun and military blogger, very much part of the Milbloggers. He even went to the White House along with other military bloggers to have a meeting with President Bush. That was an adventure for both of us. I didn’t get to meet the President, but I got to go to the White House and while they were meeting in the Roosevelt Room and Oval Office, I got a special, private tour of the White House, and I got to meet, briefly, Barney, First Dog, when I was going out to the Rose Garden. I’d probably rather meet Barney any day. Politicians creep me out. How’d we do? Many hits? Actually, more hits than ever for this blog yesterday. A whole 115. 10 years ago, I was getting about 1,000 hits a day. How the mighty have fallen. You’d find a going theme if you still wanted to do it. Sometimes enough is enough? I don’t aspire to that. I’m just putting up stuff I like so if I ever manage to sell this novel and someone comes looking for “who is this guy?”, there will be something there. I hope to expand it this winter. With some homestead stuff, gardening, chickens. Maybe a page with some shorts. Speaking of which, have you read Cyn’s short stories? SWWBO? Good shooting, especially first time with the gun. “Armoury”; ‘arsenal’ is where you make the guns. I didn’t know that either. You see it misused so often. … and the “armoire” is where you hide your precious one when the spouse enters ‘unexpectedly’. Well, it is a collection that has taken many years to accumulate. And that is not the complete collection. Oddly, and awful lot of people think they are going to head here when the Zombie Apocalypse starts. A definite failure of imagination.